The first day of the trip to visit three new states, so I celebrated with a double helping of ham and eggs for breakfast. Then it was back onto I-40, through more glorious scenery. The Colorado Rockies are still my favourite part of USAnia thus far, but this part of Tennessee is certainly up there with the rude boys. Even if Officer Twit did his best to spoil it by maintaining that I hadn't slowed down when passing one of his fellow plods on the hard shoulder with his lights on, and I hadn't changed lanes either. I couldn't change lanes because the one next to me was inconveniently full of about forty tons of Big Lorry. I had slowed down, by dint of coming off the loud pedal and letting gravity do the rest but as far as Officer Twit was concerned you can't slow down without using the brakes. Twit. A few miles after this contretemps the route forked left onto I-81 and into the foothills of the Appalachians. These are Teh Awsum and one day I'll come back for a proper look. 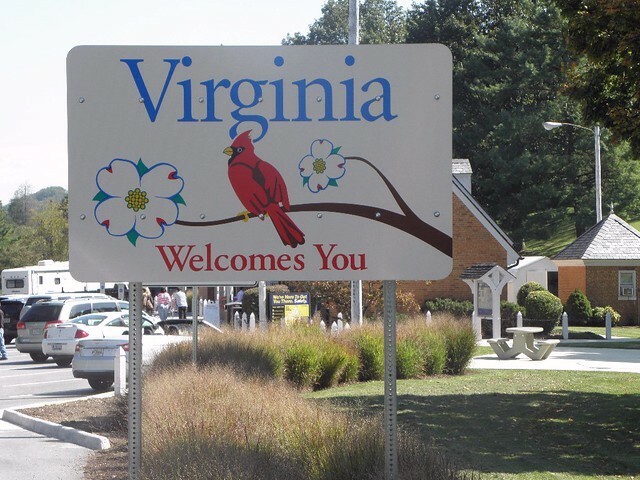 After about 90 miles things become Virginia and look even better. Virginia. A place of Splendid. The drinking fountain at the rest area where the above photo was taken has a neat feature - a separate knee-high outlet to allow one to fill a water bottle, dog bowl, etc. The person who thought this up should be heartily congratulated for Cleverness. It's frequently amusing to see FOREIGN place names transplanted willy-nilly into USAnia. Not far from here, over the state line in Kentucky, Glasgow and London are not so far apart, with Somerset somewhere between the two. My favourite juxtaposition came at exit 19. Leave the freeway here and you could go to Abingdon. In the other direction: the road to Damascus. After eighty odd Virginian miles I swing south onto I-77. This goes across the grain of the land, culminating in the ascent of the famous Blue Ridge. If there ever was a Lonesome Pine up there, it's been joined by about twelve million others. Lots of Smells to be had with the top down, including grass where they've been mowing the median strip, trees (various) and, inexplicably, jet fuel. Is there a plant native to these parts that smells like A1? A seven-mile descent drops the road into North Carolina. So down the 77 to Charlotte, which is huge. Emily sent me off on a rather convoluted route, culminating in about twenty miles of vile ribbon development largely populated by the kind of six-fingered sister-shaggers (© Morrisette of yacf) who brake for green traffic lights. After twenty miles of this I was ready to commit all sorts of Crime, but then Emily told me to turn right, the traffic vanished and the road undulated its way through pine forests and cultivated land. It all rather reminded me of Les Landes in south-west France, except for the GBFO Walmart depot. The aforementioned six-fingered sister-shaggers are probably those responsible for reminding unwary visitors that yes, this IS the South. Yesterday there was an anti-abortion poster on one side of the freeway and an anti-evolution one on the other. Then there was the wanky Toyota pickup which added being in teh gayers to the list of Terrible Sins. This morning a store on the frontage road proclaimed "JESUS IS LORD" in big letters on the rear of the building, facing the interstate. On the side was a simple description of the products on sale within. GUNS. Abortion seems to be the favourite bugbear of those whom some commentators have described as "the American Taliban" though. Back to the road. 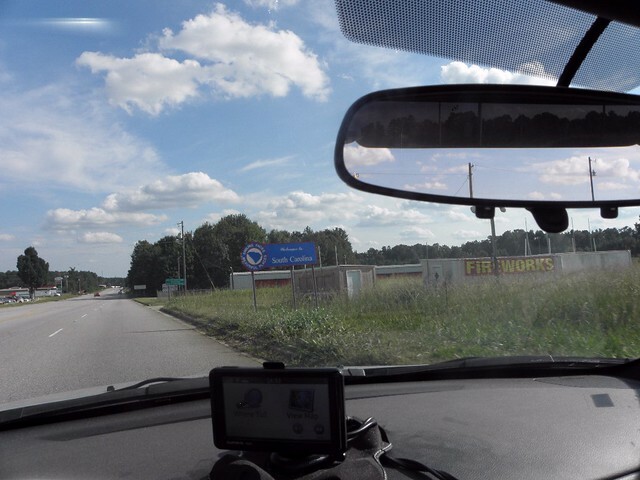 I missed the crossing into South Carolina the first time round so went back for another go. The reason that this picture is so piss-poor is because the sign is located immediately after a busy crossroads, so I had to snap it one-handed from a moving car. It looks better in the large version on flickr, honest. That's Emily in the foreground, by the way. A mile or two down the road I pulled over to have a look at the photo, in case I needed to go back for another go. A couple of teenage girls walk past. TG#1: I like your car, mister. Mr L: I don't. It's rubbish. TGs depart at a brisk stroll, uncomfortably aware that they are in the Presence of Madness. After all, who but a complete loonhouse would buy a car that he knew to be rubbish? They didn't notice the discrepancy between Florida plate and BRITON'S accent but then again, neither did Officer Twit, and he's supposed to be a trained observer. And so to Florence. On the plus side, the museum doesn't open until 10:00, so I can have a lie-in. On the minus side, South Carolina is one of those downright uncivilised states where the liquor stores close at 19:00 chiz. I ought to know better by now, having been caught out by this in Washington in 2009. Bah! At least I can uncap a fresh BEER without having to get up. 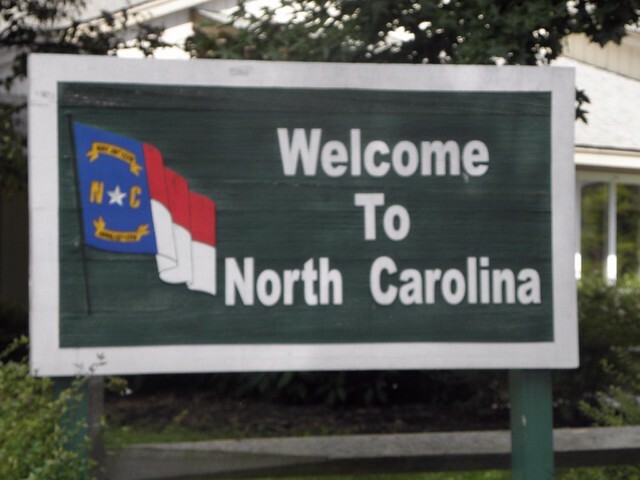 New states visited: Virginia, North Carolina, South Carolina. And apoplexy. Thirty off the bingo card now and one more to go this year.